​Dr. Goble moved to breathtaking Logan, Utah, many years ago. As he was busy researching, prototyping, and then bringing medical products to market, he purchased a precision CNC machine shop and a precision Swiss CNC shop. 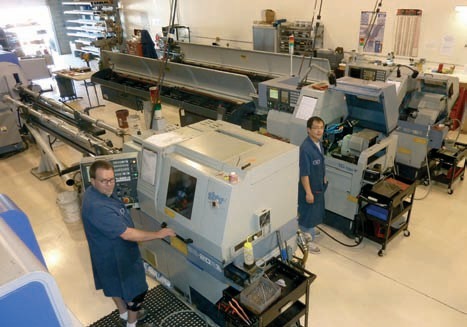 The machine shop was acquired to support Dr. Goble’s R&D efforts, and the Swiss CNC shop was bought for the purpose of manufacturing production parts. Dr. Goble aptly named the manufacturing entity “Medicine Lodge”. Other companies founded by Marlowe include a facet arthroplasty device company, Facet Solutions; Western Surgery Center; and Frontier Biomedical. Dr. Goble’s most recent research company, Venture M.D., currently develops and funds orthopedic research ideas. The company is well known for its expertise in small machine parts, ranging from ¾ inch to .010 inch in size. The two brainstormed their company name for what they wanted their company to represent, the pinnacle, or height of precision machining. And with each of the founders having worked in the machining industry for 25 plus years, making parts for the aerospace, medical, defense and artillery industries, the company can make some of the most complex small parts. Pinnacle Precision also prides itself on its ability to make parts out of some of the more difficult to machine metals as Titanium, Stainless, Inconel, Incoloy, and Nickel. Their customers reside throughout the United States, and even into Canada. Pinnacle Precision also owns a wire EDM machine, and some of the most sophisticated inspection equipment available. 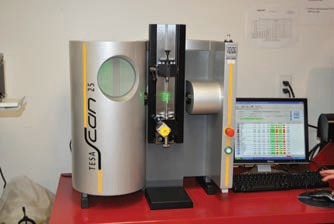 “Our Brown and Sharp Tesa Scan can test product accuracy to within 40 millionths”, Dan said, “which is the equivalent of the width of a piece of paper sliced 75 times.” And you will be hard-pressed to find the Oasis (Optical Automatic Smart Inspection System) in many machine shops. 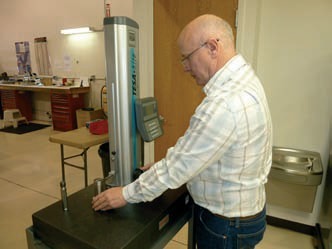 ​With years of experience at very large manufacturing facilities, including Parker Hannifin, Williams International, and Medicine Lodge, making very high tolerance, precision parts, ISO certification was something that Ken and Dan knew that they would have to take on. 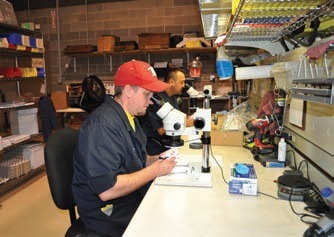 “We put all of the processes in place from the time we opened the business”, Dan said, “and so when we had sufficient funds last year to go through the Certification accreditation, it literally only took us 1 month to complete.” Both Dan and Ken believe that the ISO certification facilitates productivity improvements and results in a more efficient and well run operation. “The scores count”, Dan said. “Our typical scores for quality and on-time delivery are 97% or better.” The company takes pride in their philosophy of “parts aren’t done until they are cleaned and de-burred”. The company invested in an ultrasonic vapor degreaser, and all de-burring stations are equipped with microscopes for 100% inspection. 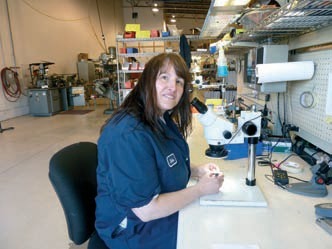 “We’ve been using Pinnacle Precision as a supplier for more than 5 years now. They machine components for our end products, which are medical devices. Pinnacle Precision produces good product consistently. Their pricing is outstanding, and they are extremely responsive. Occasionally, we have an issue to resolve, caused when the print call-out is unclear or we change our method of inspection. On these rare instances, the team at Pinnacle Precision is extremely responsive. They also work with us when we need an expedite. 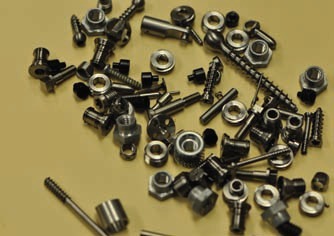 “Pinnacle Precision has captured the majority of our screw machine business over the past several years. Their quality and their support is outstanding, and their pricing is very competitive. “We have been purchasing machined parts from Pinnacle Precision for the past ten years. They are considered one of our most reliable sources for machined parts under 3/4” in diameter. I can ask Dan or Ken for a quote today and find a response in my inbox by morning. This is extremely valuable in today’s competitive environment. They are very strong when working with “hard to machine” exotic alloys (nickel,cobalt etc. ).